Welcome to week 2 of White Board Friday (series 2). 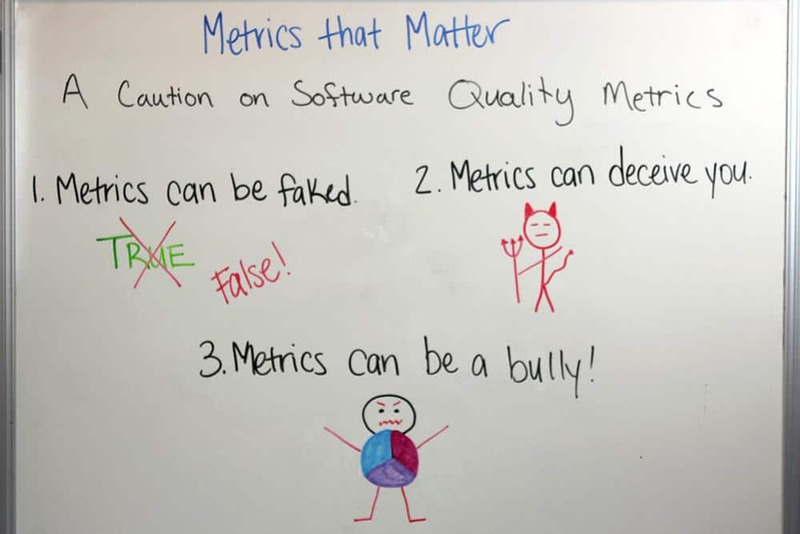 In this video we continue our conversation around “Metrics that Matter” – specifically diving into areas you should be cautious of when analyzing software metrics. Metrics Can be Fake — It happens all the time, not necessarily deliberately but pressure can lead to people reporting on data in a fake way. Maybe da ta is communicated or displayed in a certain way to help show the story they want to tell. Metrics Can Deceive You — Make sure you are looking at the metrics but not buying into everything you see. You need to ask questions around the metrics being pulled. One way is to creating smaller tests that pass easily or even creating unit tests. Metrics Can Be a Bully— A lot of time organizations put in place metrics before they put in place processes. Creating competitions against metrics can lead to employee and team moral issues.